Does the dreary, gloomy winter have you down? Brighten up your day with these cheery cottages from Sears. Image courtesy of Ray Witter. These are from a series of Sears home paintings created by artist Ray Witter. Ray grew up in Pittsburgh, and was always told that his family home was from the Sears catalog. Years later Ray came across some of the old black and white Sears Modern Homes images online, and he was inspired to reinterpret those images in vibrant, happy colors. 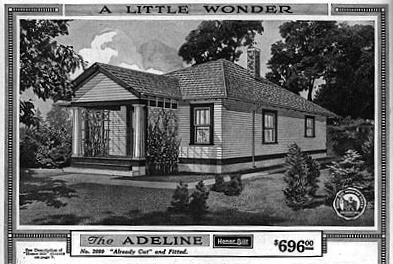 The Sears version of the Adeline. Ray's sunny version of the Adeline. Image courtesy of Ray Witter. Ray has painted 10 different Sears models using acrylic and wall paint. In addition to his Sears homes series, Ray also has a series of Craftsman country cottages. 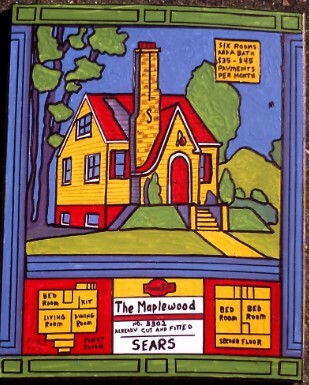 Prints of the Sears homes sell for $25. If you're interested in Ray's art, you can reach him through Facebook or email.